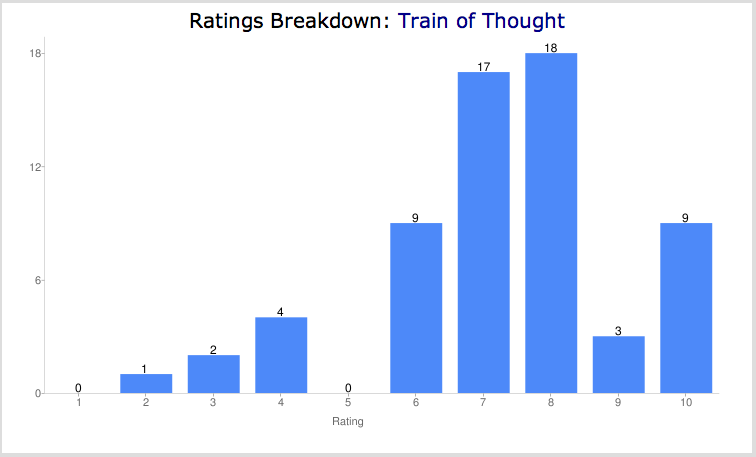 Another written review for Train of Thought on boardgamegeek! Gerald Gan wrote up a very nice review with a lot of nice things to say about our game! Always nice to read. Thanks Gerald! Here’s the review. Boardgameblogger has posted a video review of Train of Thought over at boardgamegeek.com! For those who don’t have 9 minutes to watch the video, here’s the skinny: He loves it! Thanks to boardgameblogger for taking the time to play and review the game. What a nice birthday present! You can check it out here. Interview with the Creators of Train of Thought! Still unpacking in my new place – but wanted to share this interview we did with Giant Fire Breathing Robot. Check it out to learn more about the history of Train of Thought as well as more info about our next game Belfort. I’ll also use this as an opportunity to update everyone on Belfort: As of last week – it has been sent to the printers in China! We’re anticipating a summer release. The art is super amazing and we’ll be leaking some images online over the next few months to start building up the hype! And in the bad news department, our third game – But Wait There’s More – just got cancelled. Apparently there’s a game coming out this year that’s eerily similar to our game and so we got cancelled. Very sad of course, but understandable. Onwards and upwards! Train of Thought: It is pretty cool to have a game in the top 2500 on boardgamegeek (which means this is based on users rating it). Here’s the screen grab! And it’s nice to see the breakdown of all the votes so far. It’s valid and fair to see that there are a few people that just don’t get or like the game; it’s bound to happen with pretty much every game! But it’s great to see so many people enjoying it! If you’ve played the game and want to rate it, then just log into www.boardgamegeek.com (and register if you haven’t yet) and rate it at the very bottom of the page. There’s also some exciting news about Train of Thought…but there’s still an official contract that needs to be signed before we make that announcement. Stay tuned. Belfort: We’ve been getting a lot of art updates for Belfort these past two weeks and now we have seen all of it! I’ve got to say that this game has the best rule book that I’ve ever seen! Josh Cappel has gone above and beyond and we’ve upgraded his credit from Artist to Artist and Rules Editor. It is easy to read, has tons of examples and pictures and even has quite a bit of humour throughout. Some last minute tweaks and she’ll be off to the printers. But Wait There’s More: We have some exciting news for our third game, But Wait There’s More – but we can’t tell you yet! Dang – not really a good update on that one. Soon you’ll be in the loop. Jam Slam: Just got word from the Product Development and Marketing Manager at Gamewright that Jam Slam received some nice marks and now they’re looking to see if they can find a slot in their 2012 line up or not. Exciting! Akrotiri: Got word from Zev at Z-Man games that he’s been crazy busy, but plans on getting this game on the table to test this month. Can’t wait for this one as this is my favourite game we’ve made! Junkyard and Lost For Words: We’re just getting ready to send these games out to Asmodee for review. Secret Project: We’ve been told by a publisher of a type of game that they’d be interested in publishing that involves licensing a known property. We’re currently doing a lot of research on this one. Updates might be a little slow over the next week or so as I’m knee deep in packing for my impending move next week. Moving closer to civilization and will be moving to Vancouver proper (instead of telling everyone that I live in Vancouver – kinda). Movin’ on up – slowly but surely! We’re hopeful that Jam Slam will be our first children’s game to be published. Gamewright is a strong company that really stands behind their product. They submit their products for a lot of reviews / awards and the market penetration they have in some of the different areas like bookstores (Chapters) and educational stores (Scholar’s Choice) is awesome. We’re anxiously awaiting word back from them – fingers crossed! I would love to see how they handle the flyswatters we’ve been using in our prototypes. Same with Z-man. Z-man has great production value and they’ve handled some great titles (Agricola, etc.) so getting on their roster with Akrotiri would be a nice feather in our collective cap. And Asmodee is another company that is very distinguished in the game publication biz. While Junkyard and Lost for Words aren’t exactly what you might think of as standard fare for the company that published SdJ candidates like 7 Wonders, they also have a few hidden gems like Jungle Speed and Good Question! for their lighter fare. So, getting our games looked at by them is a good thing. Getting one or more published by them would be amazing! But Wait, There’s More! We’ll have to tell you more about But Wait, There’s More! in the near future – rest assured that it’s gonna be a busy few months for the Jay/Sen machine. Between all the games in production, out for review, and in development, I’m not sure when either of us will find the time to sleep. I’ll hopefully be able to do some updates while Jay’s moving, so that you, our faithful readers, aren’t left wanting! Now Playing: Train of Thought Commercial! The Train of Thought commercial is now available for all to see! We wanted to make a video/commercial that could showcase how the gameplay worked, but we didn’t want to overstay our welcome, so we kept it to under 1 minute. 1) First we got approval from the publisher, Tasty Minstrel Games to make the video, which included them signing off the script we wrote. 2) I’m fortunate enough to work in a company that has a videography department, and so I asked both of the videographers – Darren Jones and George Coucopolous – if they could help film it, and they agreed! 3) I recruited a few actor-friends that I know and we shot the video in lat January, 2011. In the video: Xavier Cousin, Floyd Sandiford, Leslie Dancey, Joel Stephenson…and me! 4) Darren Jones then took the footage and started to edit it down and even was our voice over announcer! 5) We wanted a floating thought bubble to appear and found some online, but they cost a lot of money, so we asked our good friend, Errol Elumir, to create one from scratch for us. He did, and after a few requested tweaks we ended up with what’s in the video! 6) Once the video was final (at least the length of the video was final), Sen went to work and created the entire theme song that plays throughout the video. That’s even his voice singing in the background. Sweet! 7) Finally we go through 3-4 rounds of minor tweaks and adjustments and we’re done! Thanks to everyone who helped make this commercial. It’s really amazing how many talented friends we have! And now without further ado, here’s the video!